A vividnew photo of the sun has revealed a new view of a solar eruption in the star'snorthern hemisphere that blasted charged particles in Earth's direction thisweek, according to NASA officials. Thesolar particles began striking Earth's magnetic field Tuesday and sparked apowerful 12-hour geomagnetic storm and spectacular aurora displays. The flarewas not powerful enough to pose a radiationthreat to astronauts living on the International Space Station, NASAofficials have said. Thisnew multi-wavelength extreme ultraviolet photo from NASA's Solar DynamicsObservatory shows the sun in mid-eruption. Theflare is visible as the white area on the upper left, and the ensuing solartsunami is the wave-like structure in the upper right. Magnetic filaments canalso be seen coming off the surface of the sun. Thedifferent colors in the image represent different temperatures of gas. 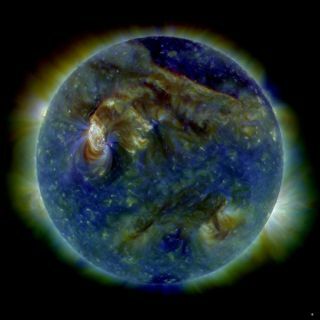 Theeruption, called a coronal mass ejection, was spotted by NASA's Solar Dynamics Observatory , which captures high-definition views of the sun ata variety of wavelengths. SDO was launched in February and peers deep into thelayers of the sun, investigating the mysteries of its inner workings. Analystsbelieve a second solar flare could come on the heels of the first flare, andcould re-energize the fading geomagnetic storm and spark a new round of brightaurora displays.